NEW! Check out the ultimate joy ride in our new Slingshot - a three-wheeled roadster that delivers a ride like nothing else you’ve ever experienced. You’re probably thinking about visiting our part of the world because of its spectacular beauty and unparalleled outdoor recreation opportunities. 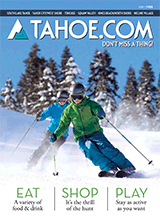 Lake Tahoe Adventures was started over 20 years ago – and is still owned and operated today – by local Lake Tahoe folks who love the backcountry. This is our home and we like sharing it with others. We’ve taken thousands of people from all over the world out to see and do things that they just can’t experience back at home. Still, no two guests and no two tours are alike. We’re confident that we can show you a special adventure that you will remember for a lifetime.